NovaNet-WEB is a Remote and Online Backup software for Windows 2003/XP/2000/NT/Me/98, including both client and server components. 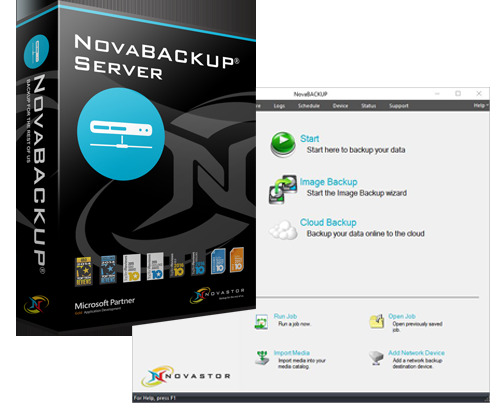 NovaNet-WEB gives businesses the ability to setup a cost-effective and highly efficient backup solution. The NovaNet-WEB Client software can be automatically configured and distributed to hundreds of desktop and laptop users. Predefined file selections and backup schedules can be configured so every user can have their important data backed up automatically each day without any intervention. Redundant files are tracked and eliminated. Restore any version of a file from any location on the network. Customization of the NovaNet-WEB Client software includes adding your company name, product name, contact info, splash screens and more. ASPs, ISPs, VARs, Consultants and entrepreneurs can setup a NovaNet-WEB Server and provide off-site backup services via dialup or direct network connection. NovaNET tape and disk backup software for Windows, NetWare, and Linux networks is designed for cross-platform environments to meet the demands of users with either homogeneous or mixed operating systems installed, all of which can be centrally managed through its common graphical user interface. Convenient features for remote administration, distributed backup processing, redundant tape drives, virtual-tape-on-disk and disaster recovery are seamlessly integrated and can be enabled to fit the user's requirements. Additional online data protection plug-in services are available to support Microsoft Exchange, Microsoft SQL and open file backup. Whatever the user environment, NovaNET adapts to ensure complete data protection.